With just 2 games involving New York Islander prospects, Sunday was a day to marvel at the amount of talent the Islanders have amassed for their blueline as they make their move to Brooklyn in 2015. The Islanders just might have the best young corp of defensemen in the NHL and if they mess up their development they should never be allowed to work in hockey again. 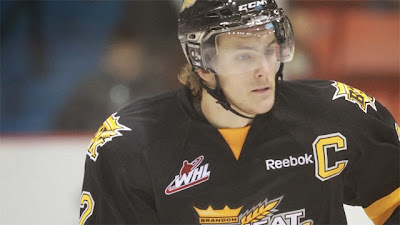 Ryan Pulock (NYI 2013 1st) led his Brandon Wheat Kings to an 8-4 win in game 2 of their WHL playoff series against the Regina Pats on Sunday. There appears to be some confusion as to which team is suppose to be the number 2 seed and the number 7 seed as Brandon has done what they want when they have wanted to. In game 1 it was a 4 goal 1st period and in game 2 it was a 5 goal 2nd period which blew the game wide open for the Wheat Kings. Pulock with another multi-point game going 1-1-2 with a +3 was the 3rd star in this game. Brandon would come out of the 1st period with a 2-1 lead and in the 2nd, it is doubtful that Regina knew what hit them. After Regina had cut Brandon's lead to 4-2 was it time for Pulock to do his magic. First Pulock set up John Quenneville for a power play goal at 15:39 to make it a 5-2 lead (this goal wound up being the game winner) and then Pulock would score his 2nd goal of the playoffs at 18:15 to make it 6-2 which was followed by yet another Brandon goal at 18:45 and this game was over. Pulock is 2-2-4 after 2 playoff games but 4-8-12 in his last 5 games which carried Brandon to a playoff spot. For Regina fellow Islander prospect Kyle Burroughs (NYI 2013 7th) was scoreless in his 2nd game back from injury. With game 3 heading to Brandon, Burroughs is going to need to elevate his game like his fellow prospect has or it will be a short series for Regina. Game 3 will be in Brandon on Wednesday. Griffin Reinhart (NYI 2012 1st) doesn't have the offensive skill that Pulock has but he is the heart of the Edmonton Oil Kings. Take Reinhart out of the Oil King lineup and they are just an average team. The Oil Kings and the Prince Albert Raiders fought to a 0-0 draw after 2 periods when Prince Albert made the mistake of scoring just 20 seconds into the 3rd period for a 1-0 lead. Edmonton would respond with 3 unanswered goals for a 3-1 win and a 2-0 series lead. Reinhart was scoreless as Edmonton made the plays when they had to have them, The series now shifts to Prince Albert for game's 3 and 4 on Tuesday and Wednesday. The invites have gone out and there was no surprises in the invites for the NCAA Tournament as the Pairwise system called it like it predicted. For more on who is going where and playing when please check out this from the College Hockey News. Calgary at Kootenay is how I spend my Monday night folks be there.